The Near Archive is a digital audio database of interviews originally broadcast on Near FM’s flagship community affairs programme Northside Today between the years 2011 and 2016. The Archive was officially launched on Wednesday 16 November at 6.30pm in Coolock Library by Dr Pauric Travers, chairperson of the Broadcasting Authority of Ireland. The content reflects upon the themes of Irish Culture, Life and Experience with a particular emphasis on local arts and culture, local news, history, heritage and community events. The total number of archived pieces in this collection is presently c.1,200. We have for some time provided online access in our branch libraries to the complete issues of Irish newspapers via our subscription to 'The Irish Times Newspaper Archive' and to the 'Irish Newspaper Archive'. Both subscriptions provide access to full digital copy and a search facility; the Irish Newspaper Archive giving access to most (all?) of the regional papers plus the Irish Independent and the Irish Examiner. Important to bear in mind though that the most recent issues (in both subscriptions) may not be available, i.e. most recent daily will be some 7 to 10 days old, while weekly papers may not include the most recent issue. A handy point of access to these subscriptions is provided on our Netvibes-based portal (note: both subscriptions available on library computers only). Last Wednesday (26th August) saw the formal launch of a new website hosting a range of databases totalling over 5 million records. The databases are useful for genealogy, local history and social history. Many of the databases were previously available and searchable separately on dublinheritage.ie, but the new site - databases.dublincity.ie - allows for integrated and enhanced searching while also giving access to an even greater number of databases. Our collection of material in the Business Information Centre (BIC) in Dublin City Centre holds the key to achieving a healthy body and a healthy mind. From an up–to–the minute selection of medical reference books to a useful collection of health magazines, the BIC is a valuable resource when it comes to health information. A special feature of our Centre is the vast collection of newspaper cuttings contained in our Subject Files and available on public access, files covering all manner of topics including Health, Mental Health, and Health & Safety. The Decade of Centenaries Award was established by Digital Repository of Ireland (DRI) in order to engage with custodians and assist in the long term digital preservation of valuable digital material relating to the 1912-1922 period in Irish History. On Thursday 25 June 2015, it was announced that the Dublin City Electoral Lists for the period 1915, recently digitised by Dublin City Library and Archive, was one of three award winning collections. To mark the occasion, we take the opportunity to reproduce here the following from askaboutireland.com © Dublin City Public Libraries. A new website allowing for the cross-searching of a number of databases produced by Dublin City Public Libraries & Archive can now be accessed online. If Ever You Go This April! The Central Library, Ilac Centre, is currently offering Touch-type Read and Spell (TTRS), a free online computer course. As well as developing typing skills, TTRS is designed to benefit students of all ages who experience spelling, reading or writing difficulties. Students with dyslexia or literacy issues have found it helpful. This is a multisensory, structured, online course which assists students to learn at their own pace either in the library or at home. The Central Library has a number of licences available to library users. Read more about If Ever You Go This April! What do Bressie, the Dublin team and Eoin Colfer have in common? They are all champions for reading! Singers, runners, footballers, and actors are among the well known personalities to give their support to readingchampions.ie, a new website which promotes positive role models for children’s reading. 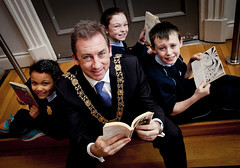 Right: Taylor, Emma and Josh with the Lord Mayor of Dublin Oisín Quinn at the launch of the Reading Champions website. ‘Reading is one of the most important gifts a parent can give to their child’ said Dublin City Lord Mayor Oisín Quinn, speaking at the launch of the site: ‘Reading opens so many opportunities and possibilities to children. Not only is it a valuable educational tool it is also food for the imagination and soul. The Reading Champions website encourages and promotes reading to children by featuring twenty three well known people sharing their experiences of reading. I want to congratulate the work of all the librarians involved in bringing this project to fruition, I know it will be a great source of inspiration for everyone who uses it” said the Lord Mayor. Read more about Reading Champions Love Books!